Tax Day is the last day that we can make our 2015 contributions to our Individual Retirement Accounts. Even if you have a 401(k), you can still have either a Traditional or Roth** IRA to make the most of your retirement savings. Your contributions may also be tax-deductable, which means they could reduce your taxable income and, therefore, the amount of tax you have to pay. If that’s the case, then each year you make a contribution, you could reduce your income tax and any gains in your account in your account will grow tax deferred. The earlier you start saving with an IRA, the sooner you can start reaping the benefits of compounding and increasing your potential retirement income. Using the financial calculators at Bankrate.com****, you can see the potential results. Opening an account with Summit Investment Management is simple and easy. You can either open an account online and access portfolios designed to align with your individual risk profile or you can contact us for a New Client Enrollment kit that gives you access to our advisors for a more personal experience. Either way, you can benefit by investing your retirement savings with an experienced investment team that actively manages your portfolios making investment decisions that are based on our highly disciplined, rules-based selection process. So what are you waiting for? April 15th is just a few weeks away, start investing in your future today! *April 15th, 2016 is the District of Columbia Emancipation Day and is considered to be a legal holiday so the due date for the 2015 tax returns is the next business day April 18th. 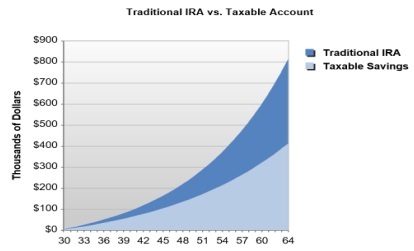 **If your income exceeds $131,000, you cannot contribute to a Roth IRA. ***These examples are for illustrative purposes only and do not represent the performance of any specific product. They assume a hypothetical 7% annual rate of return in a tax-deferred account. ****Bankrate.com is an independent, advertising-supported publisher and comparison service. Bankrate may be compensated in exchange for featured placement of certain sponsored products and services, or your clicking on certain links posted on this website. Learn more by visiting their site.